During the 2006-07 NHL season, Dean Lombardi‘s first year at the helm in Los Angeles, Kevin Dallman and Mike Weaver combined to play 92 games on the Kings blueline. While I’m sure that wasn’t what Lombardi was thinking about as he stood and watched part of Rookie Camp today from the Kings bench, he almost assuredly was smiling inside watching Jake Muzzin and Nic Deslauriers. They’re two of the brightest young stars in the organization. Entirely different players on the ice, they share the same problem away from it. With a solid six d-core at the NHL level, when will they ever get their shot to make the big club? Unlike most of the other guys I spoke with on Saturday, who talked about an increased level of comfort when they’ve been to LA for at least one camp previously, Muzzin went a different direction when talking about it. Like, giving him lunch money? “I did actually do that,” Muzzin said while laughing. FYI – I’ll have live coverage throughout the day from HockeyFest on Sunday. You can follow along at the links below. 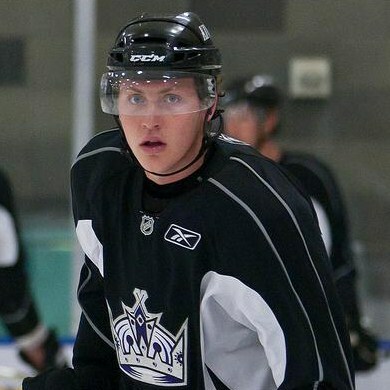 In the meantime, be sure to check out the all new MayorsManor rankings of the Top 10 LA Kings prospects – it just published yesterday.